Day 2 of our Super Food quest brought us to Rubios, Fresh Mexican Grill. What, fast food? Well, yes. While the kitchen is our playground, we do realize that while at work or on the go, people don’t have the time and available resources to prepare a full meal for themselves. You can do your prep the night before, and tote your creation along with you in a tupperware container, but that’s still a sacrafice of time that many people can’t make. To ask that everyone completely removes fast food from their diet is unrealistic. However, there are healthy options out there, many of which make use of our beloved super foods! Romaine lettuce falls into the leafy green catagory. Not only is it more nutritionally dense than iceberg lettuce, the usual restraunt salad fare, but leafy greens, as a group, offer nutritional benefits than any other vegetable group out there. We’re happy to see it being used in more and more menu options. Leafy greeens provide calcium, potassium, vitamin C and iron all in one serving. Tomatoes are great sources of lycopene, a cartenoid that pulls triple duty, fending off cancer, cataracts and heart disease. Not only that, but the humble tomato offers up a wallop of biotin, plus vitamins A, C and K.
Bell peppers, regardless of color are brimming with beta-carotene and vitamin C. Red peppers, which stay on the vine the longest, contain the highest concentration of these. If you’re short on time but unwilling to skimp on nutrition, the Chicken Balsamic & Roasted Veggie Salad is a great way to go! 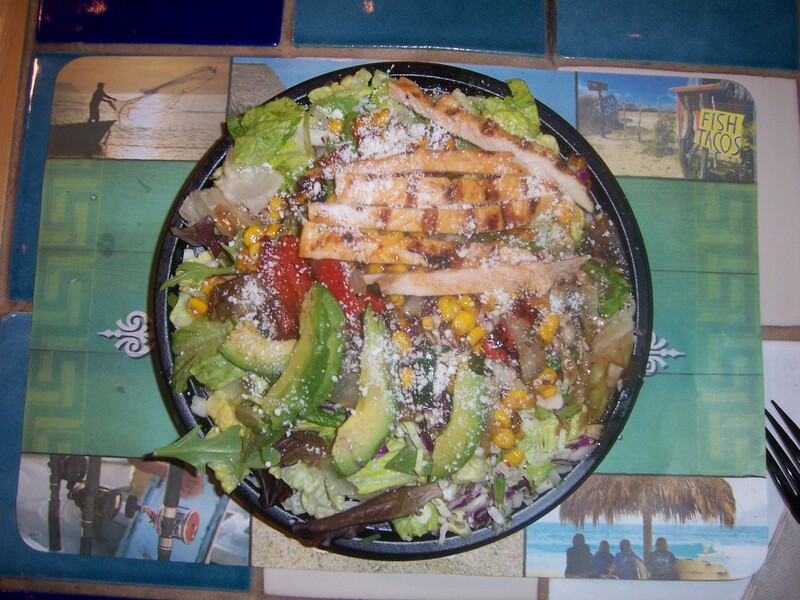 Check out Rubios on your next lunch break. 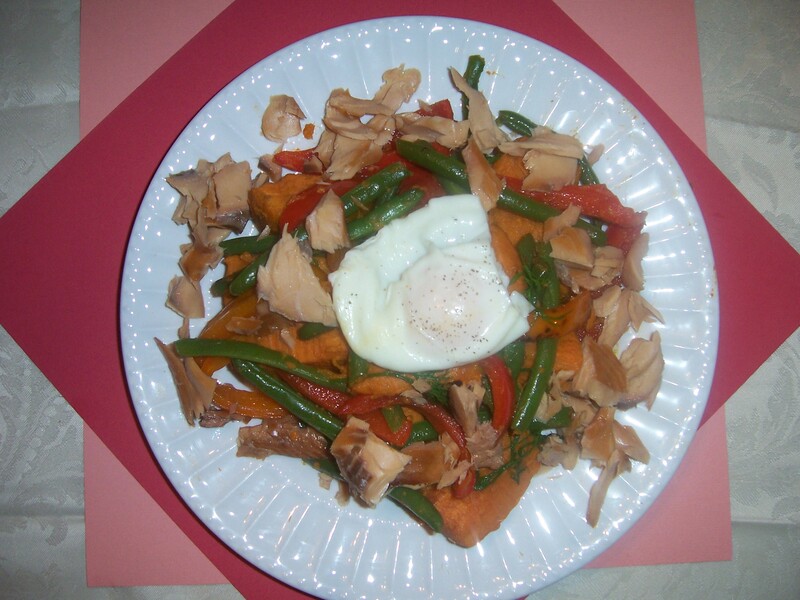 For dinner, we decided on Sweet Potato Hash with smoked salmon and egg, one of the recipes included in the “Cuisine Lite” article. This was a fantastic treat! It does take a little time to prepare but it’s an excellent source of not only super foods, but the addition of salmon and egg means that you’ll benefit from the 9 essential nutrients, and omega 3 fatty acids, and as we’ll explain later, these are fats you want in your body! We started off by skinning our sweet potatoes. This is hard work and a regular potatoe peeler just won’t do. We recommend you use a knife to undress your potatoes. We then chopped the sweet spuds into wedges and plopped them into a pot of water to boil. The article recommends 5 minutes, we used an electric stove, so our boil took a bit longer, roughly 10 minutes. We then added in some green beans, to keep the potatoes company. We let the brew bubble until the sweet potatoes were tender and the beans softened to a semicrisp. Using a slotted spoon, we removed the veggies from the pot, plunked them in a bowl, and covered them to preserve warmth. We let the water continue to boil, as we’d be using it later. On a large skillet, we heated 2 tsp. of canola oil. We then added our onions and bell peppers, then dropped in a sprig of rosemary for flavor. We sautéed this colorful mix till our onions began to brown. 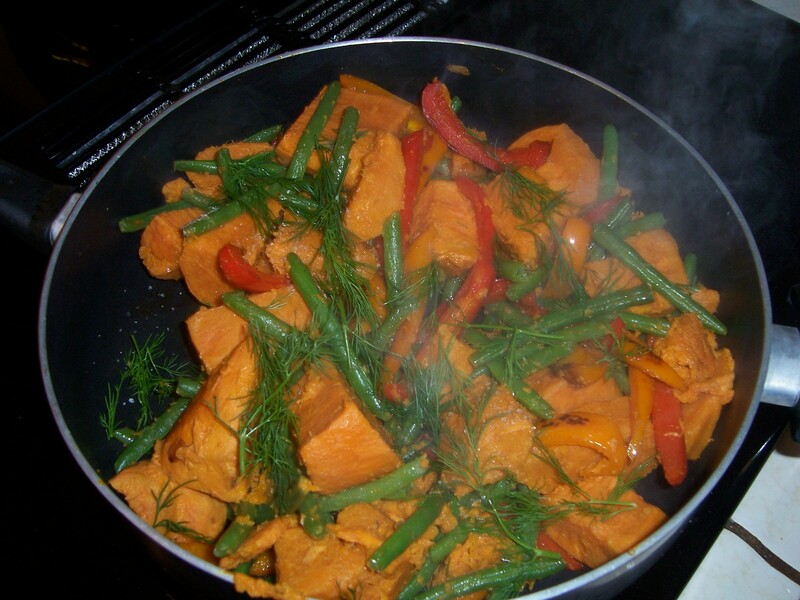 Then the sweet potatoes and green beans joined the sauté! After a few minutes of mingling, we added our dill, kosher salt and pepper. After about 5 minutes, we yanked the skillet away from heat, and discarded the rosemary. Now we turned our attention to the still simmering pot of water from whence or potatoes came. We added in a tablespoon of apple cider. Here comes the real challenge, we had to poach some eggs. Carefully, we lowered two eggs into the bubbling sea. We watched the spectral tendrils of egg white dance as the waters churned, then gently, and I do mean gently, lifted our eggs out. The poached eggs should be such that the whites are set but the yolk remains runny inside. This took us about 5 minutes. We placed the eggs on a separate plate. You’ll want to heat up your smoked salmon at this point. 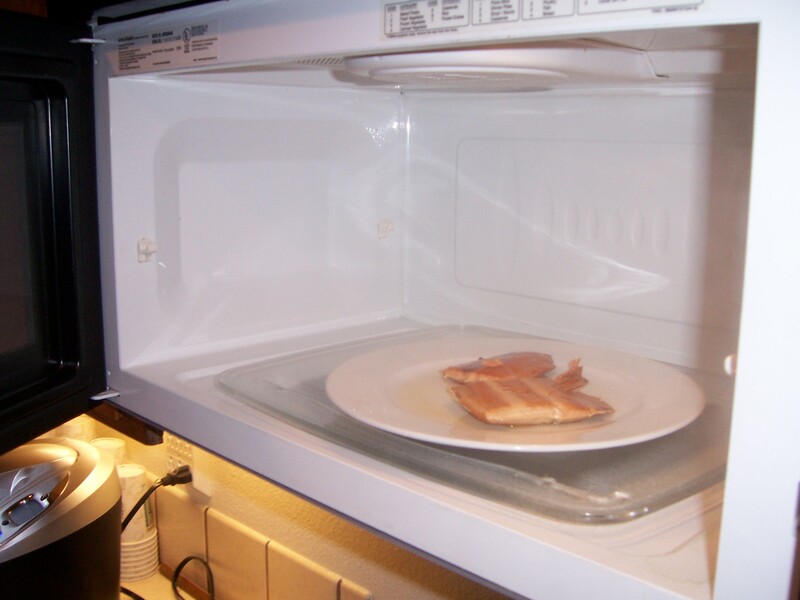 Since ours was precooked, we used a microwave for 1 minute to warm things up. Next, we separated our sautéed veggies onto two plates. We the proceeded to crumble some salmon over them. Each plate was topped with a beautifully poached egg and sprinkled with black pepper. The meal was truly delicious, a symphony of flavors. 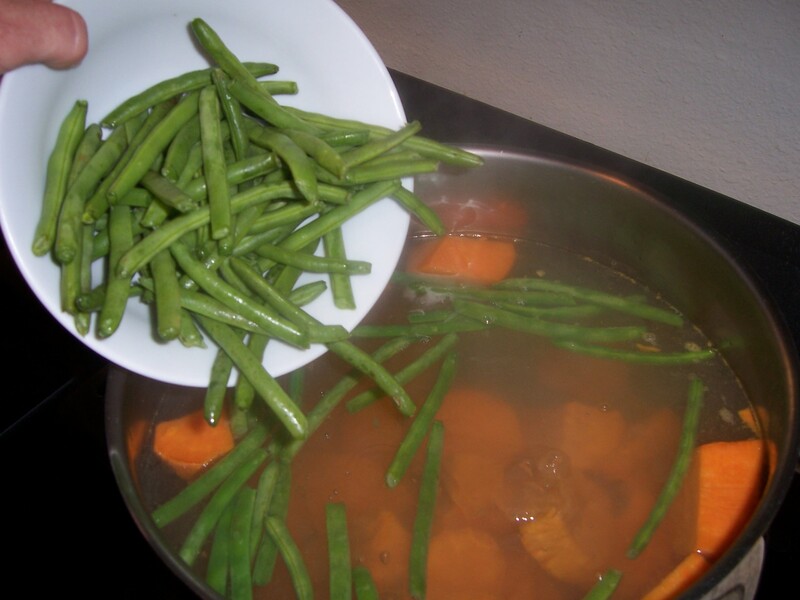 The subtle crispness of the green beans combined with the warm, gentle, dulcet flavors of sweet potatoes, and the fresh tang of bell pepper truly fascinated the tongue. The addition of salmon gave an unexpected heartiness to the meal, however if you’re not a fan of fish, the veggies stand-alone quite nicely. The poached egg was a nice addition for our taste buds, offering a subtle creaminess to a recipe that employed neither butter or cheese. 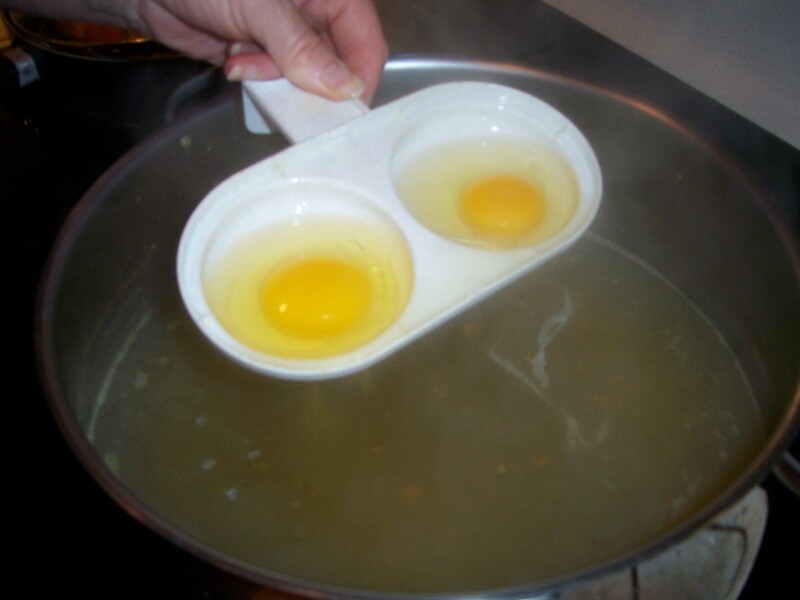 However, those on a vegan regiment could leave the egg out and suffer no detriment to the dish as a whole. We were happy to finally find a recipe that allowed us to use our super food, sweet potatoes, in a healthful way, one that didn’t involve the usual sugar and marshmallows. 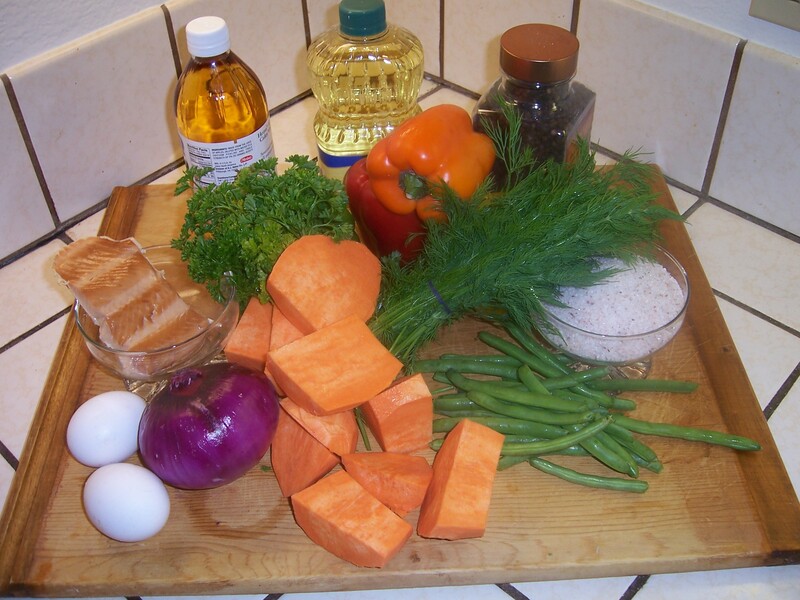 Sweet potatoes are nutritionally a stark contrast to the classic spud. These tasty tubers have much higher quantities of beta-carotene and antioxidants to boot. As if that wasn’t enough, sweet potatoes bring a serving of vitamin A and C to your table, along with potassium, fiber and vitamin B6. While not a super fruit or vegetable, we think the addition of salmon really puts this recipe over the top nutrition wise. Salmon is a great source of omega 3 fatty acids. These include α-linolenic acid (ALA),eicosapentaenoic acid (EPA), and docosahexaenoic acid (DHA), three lovely little polysaturated fats that our bodies cannot synthesize. Simply put, we need to get these essential nutrients from food if we want them, and trust me you do! 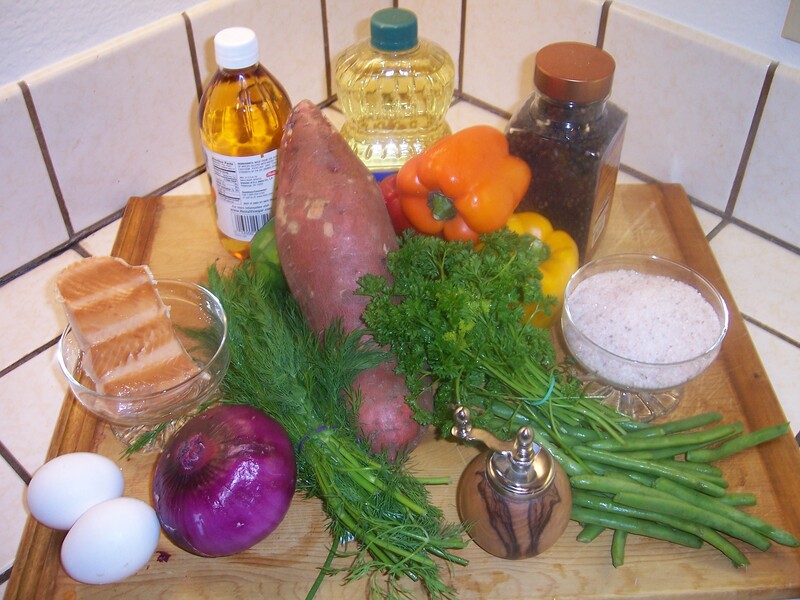 Omega 3 fatty acids play a role in stimulating blood circulation, preventing cancer in particular breast, colon and prostate cancers, reducing the risk of cardiovascular disease and boosting overall immune function.